ORTHODOXY AND WORLD RELIGIONS: Book Recommendation: "In the Beginning God: A Fresh Look at the Case for Original Monotheism"
Winfried Corduan’s In the Beginning God is largely an effort to rehabilitate the reputation and theory of Catholic linguist Wilhelm Schmidt, whose 12-volume Der Ursprung der Gottesidee (1912-54) argued that monotheism was the original form of religious belief. As Corduan describes it, the “narrative behind the method” assumes that peoples migrate, that they take their cultures with them, and thus that cultural forms diffuse, penetrate, and mix. By a sophisticated set of criteria, Schmidt attempted to explain the evident similarities among religions against the background of this story-line. His conclusion was that the most “primitive” form of religion was not totemism, animism, or polytheism; it was monotheism. Of the North American Indians specifically, Schmidt claims: “In their oldest pure forms they know neither totemism nor mother-right; they do not practice agriculture, but acquire their food by hunting, fishing, and collecting wild vegetables. Their simple social constitution is founded on the natural family, and their little village communities exhibit rudimentary chieftainship. Not, it is precisely among these three oldest primitive peoples of North America that we find a clear and firmly established belief in a High God, a belief which . . . is of quite a particular character by virtue of the high importance attributed to the idea of creation. . . . Quite a number of them have reached the highest summit of the idea of creation, denied even to Aristotle, viz. the belief in creatio ex nihilo, only by the will of the all-powerful Creator” (quoted, 199). Schmidt took the biblical record of early man seriously, and found that it cohered with the ethnographic and linguistic data. 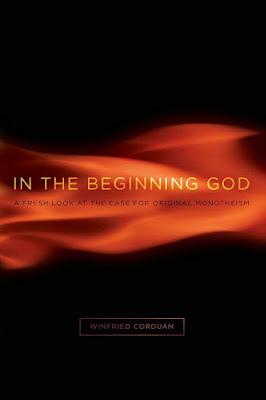 As Corduan puts it, “Schmidt did not think one could do justice to the similarity and universality of the monotheism of the least developed people groups by positing nothing more than ancient people brooding over the mystery of Dasein. . . . his ethnographic conclusions entailed that the monotheism of the Primitive tribes must have been due, at least in part, to the fact that God revealed Himself to them” (221, 223). To quote Schmidt himself, “It is God Himself Who taught humans what to believe about Him, how to venerate Him, and how they should obey the expression of His will” (223). Corduan is particularly incisive in showing why Schmidt’s arguments have been marginalized. Few plow through all 11,000 pages of Der Ursprung. Some dismiss Schmidt because he believed in revelation. Some unfairly characterize him as a rationalist or claim (as Eliade does) that Schmidt reduces the complexity of religion and ignores man’s encounter with the sacred. What is most interesting about the dismissal of Schmidt is that most theorists offer no alternative account of the origin of religion. Some have concluded that we can no longer trace the origins of religion into the mists of the distant past. Apparently, they would rather give up the quest than consider the possibility that God had something to do with the origins of the worship of God.